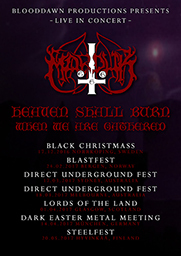 To celebrate the 20 year anniversary of the Heaven shall Burn… album from 1996, Marduk will perfom the entire album at this years edition of the Black Christmass Festival in Norrköping, Sweden on the 17th of Dec. It will be the only Swedish date that set will be played. During the first half of 2017 the Heaven Shall burn set will be performed on specific occasions. Overall between 12-13 shows worldwide. The… first row of dates are being presented here. The last selection of shows to be announced shortly…..And yes the earlier postponed Frontschwein North America is currently being rescheduled. More info soon.